The Story of the REAL Dr. Death – A Man Who Lived Countless Lifetimes. 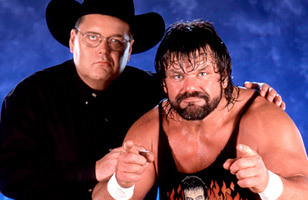 Steve Williams was one of the most amazing characters in OU sports and professional wrestling history. What you saw in the ring as Dr. Death was pretty much what you saw outside the ring with Steve Williams. In fact, at some point, Steve Williams basically ceased to exist and there was only Dr. Death. His collegiate exploits were legendary and he may have been most well known in college for a wrestling match that he lost at Gallagher Iba arena in the Bedlam dual, helping make a name for an obscure 400-lb heavyweight named Mitch Shelton and almost tearing the roof off the building in the Cowboy fans’ post match celebration. Williams turned pro as a wrestler while he was still playing football at OU, and became a revered and reviled figure around the world, especially in Japan. He battled throat cancer, helped current WWE star and former OU football player/wrestler Jake Hager (Jack Swagger) get started, and found God. I spoke to Dr. Death about his trials and tribulations in 2008. Sadly, just a year later, the cancer returned and he died in a Denver hospital in December 2009. He came to Oklahoma already in possession of one of the most colorful nicknames in the history of sports and he left with a fistful of championship rings. But that was just the start of the story of the man they call “Dr. Death”. As a professional wrestler, former Sooner football player and wrestler Steve “Dr. Death” Williams has fought many opponents around the world and he has conquered just about all of them including the most deadly of them all – cancer. 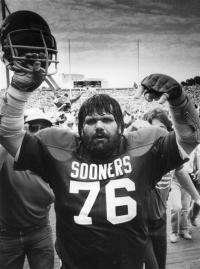 Williams arrived at OU in 1979 from Lakewood, Colorado, where he was a highly recruited lineman and a champion wrestler. He obtained his nickname after an incident in a high school wrestling match. And that nickname gradually became the only name Williams knows. Most of his fans probably don’t know his real name and even he doesn’t recognize it most of the time. At OU, he lettered four times in football for the Sooners as an offensive lineman, making all-Big Eight in his senior season. But it was on the wrestling mat where he had the biggest impact, becoming only one of ten four time All-American’s in Oklahoma history and creating some legendary moments, especially during the Bedlam Duals. Williams best national finish was a second place showing at the NCAA tournament in 1981. Following his collegiate career, Williams tried his hand at football in the USFL, but wound up in professional wrestling, working for another former Sooner, Cowboy Bill Watts, in Mid South Wrestling, which later became the Universal Wrestling Federation. “Dr. Death” captured the UWF World Heavyweight Title in 1986 and later held the National Wrestling Alliance World Tag Team Championship. Legal troubles sidetracked his career in the late 1980s, but Dr. Death emerged as a marquee performer in Japan after being seen wrestling the legendary Antonio Inoki in a sold-out match in Texas. Williams bounced back and forth between Japan and the U.S. for the next several years, and even wrestled in one of the first professional events in China. Still a major attraction in his ‘40s, “Dr. Death” ran into the toughest opponent of his career in 2003 when he was diagnosed with throat cancer. An operation was performed that affected his vocal chords and at the time, doctors gave him six months to live. But Williams battled back and has been cancer-free for the last three years. The incident had a profound effect on Williams’ life. 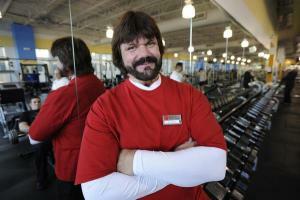 Always known as a wild man and a party animal from his days at OU through his professional wrestling career, “Dr. Death” has changed his ways and is now giving his testimony to groups around the country. With his life in order, Williams is now using his influence to talk to the next generation of wrestlers. He will be giving the prayer at the Fellowship of Christian Athletes breakfast on the opening day of the NCAA Championships in St. Louis and he plans to continue talking about his recovery. “Dr. Death” has lived in Louisiana for a number of years, but now he is making regular visits to Oklahoma through his association with a local company involved in wrestling, and he was recently honored by the OU wrestling team for his contribution to the Sooner program. One thing Williams would like to see is increased support for wrestling in Oklahoma. He is disappointed by the lack of fans at the Sooners matches. When it comes to his days at Oklahoma, Williams has nothing but fond memories of being a Sooner and is still close to his coaches in both football and wrestling.